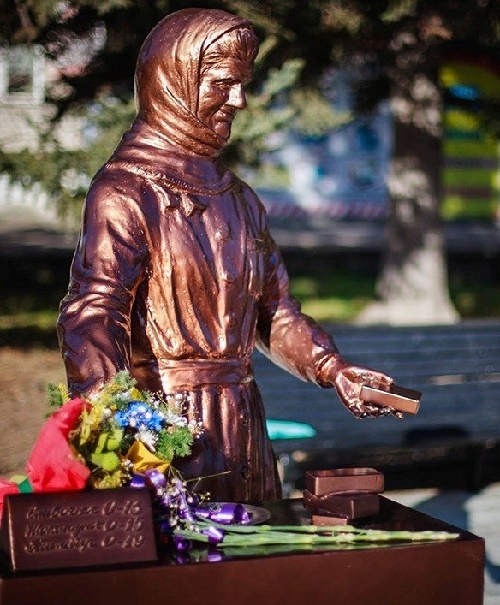 Almost the entire adult population of Blagoveshchensk remember Ice-cream seller Zinaida Sinitsyna. 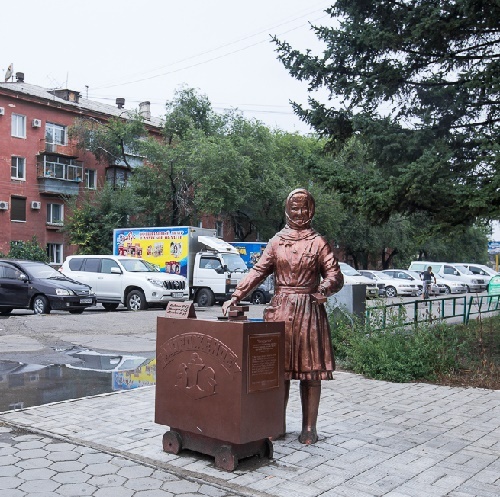 Sixteen years she sold ice lollies on one and the same place – in front of the Drama Theatre, under the three poplars that grow on Lenin Street to this day. 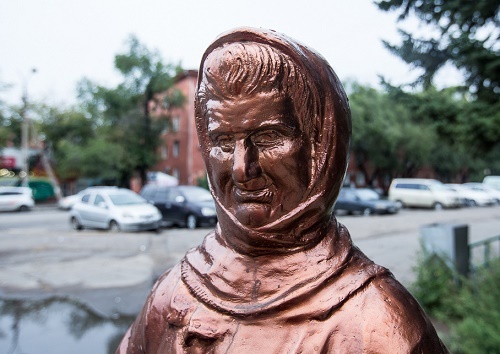 Grandma has become a symbol of childhood for many citizens of Blagoveshchensk. She was almost fairy-tale hero, and even a legend. She worked from early morning till late night, until the last bus was leaving. And young people, returning from the park of culture used to talk to her, waiting for a bus. She said that sometimes in the summer, she had to spend the night, guarding her unsold boxes with ice cream. It seemed she would be forever. And so it happened. She has remained in the memory of citizens forever. 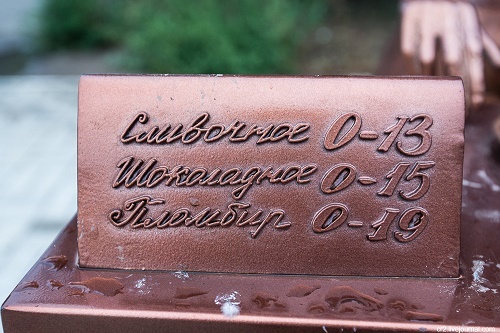 According to sculptor Valery Razgonyaev, it is a monument to our childhood. There isn’t much information about the life of a saleswoman. We only know that she lived alone. During the WWII, ​​her husband went to the guerrillas, and never returned. And her son was killed by the Germans during the war. Townspeople say that, obviously, because of loneliness, she gave herself to the work – work without days off and holidays. She even didn’t take vacation. The locals called her Snowmaiden. Rumor has it that during the life she collected 100 thousand rubles. At that time it was a lot of money: for 3000 rubles in the 1970’s it was possible to buy a car. At the same time she didn’t spend money on herself, and was modest. At the same time, she could give money out to children. She was not very tall, if not slender. Dark brown eyes, very finely drawn with pencil and plucked eyebrows. On tanned face, the wrinkles seemed to be traced. All the year round under the direct sunlight, she was standing in the street from 8 in the morning until late at night. For many years in a row. She rarely smiled, very efficiently and quietly doing their job. 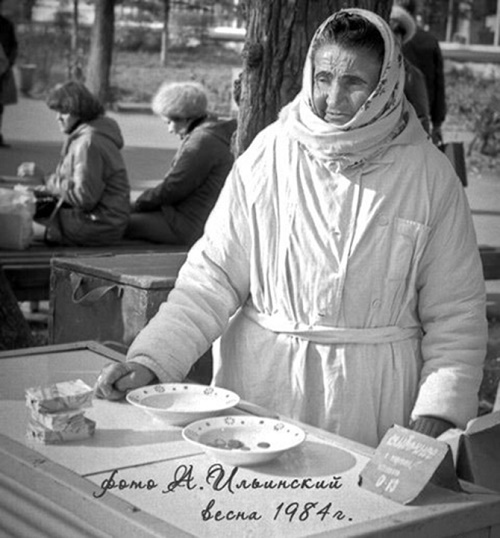 Sometimes in the summer, when from the heat melted asphalt, she was standing in the shadows of poplar trees in a perfectly white long sleeved gown, only hands flashed, giving “Two cream, ice cream and chocolate.” And people went specifically to the Snow Maiden to buy ice-cream. There was a feeling that she was a relative.